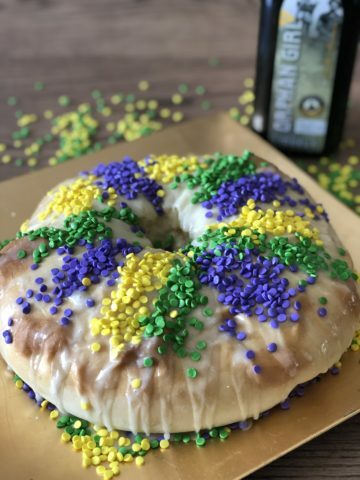 Fat Tuesday is almost here, and we’ve decided to put our own twist on a New Orleans’ classic to celebrate — the King Cake! The King Cake tradition was brought to New Orleans from France in 1870 and has become a symbol of Mardi Gras. 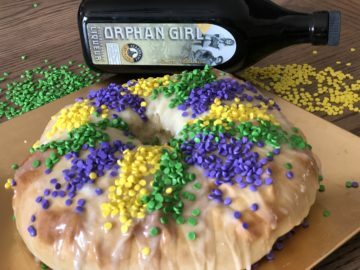 Enjoy this special treat spiked with Orphan Girl for the ultimate Mardi Gras party dessert. In a large bowl, place activated yeast and Lukewarm water mix until yeast is dissolved and bubbles appear. Add sugar, mix again. Add your milk into the mixture then slowly begin to incorporating your flour. Continue to mix until flour in well incorporated and a ball of dough has formed. Cover your bowl and dough with a cloth or plastic wrap and allow it to rise for 1 hour. Preheat oven to 350, take your dough and begin to roll it out into a long rounded piece, place your plastic baby into the dough so it is well hidden. You can buy your plastic baby on Amazon, here. using some water pull the two ends together to make a large circle. Place your cake onto baking sheet with parchment paper underneath. whisk your egg and water in a small bowl to make an egg wash and brush that onto your bread. Bake until a light golden 25-30 minutes. Once cooked, remove from oven and allow it to cool down. In a kitchen aid, whip your softened cream cheese for 30 seconds. Slowly add the powdered sugar until it is incorporated then add your Orphan Girl and cinnamon. Allow the mixture to whip together for a few minutes until the consistency is light. Place into your piping bag. In a separate bowl, combine powdered sugar, vanilla, and milk to make your icing. The consistency should be pourable, if it is not add a Tb. more of milk. Take your filling and begin to fill your bread from the inside of your circle, by using the tip of the piping bag to puncture the bread. Do that on the inside and outside of the bread. Take your icing and pour it onto the top of your bread until the top is covered and immediately place your sprinkles on top: Purple, Green, Yellow (or Gold). Serve to a large group! Whoever gets the baby in his/her slice of cake will have a year of luck and prosperity, or so they say. Let The Good Times Roll! It’s time to get festive! 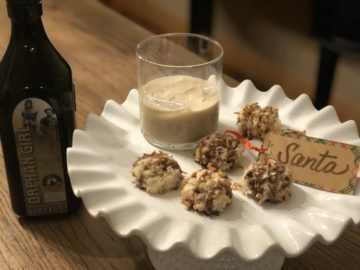 Thanksgiving is mere days away and if you need an appetizer that will impress your Thanksgiving host — We’ve got you covered! 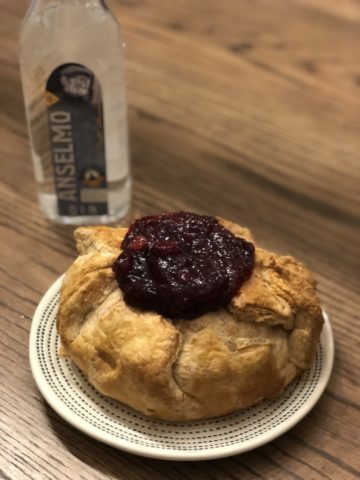 This baked brie is crunchy on the outside and soft and melty on the inside, topped with a boozy cranberry sauce for a sweet and tangy effect. Serve it with crackers, apples, or even all by itself, it’s a crowd favorite. Thaw your puff pastry in the fridge overnight. Once ready, use a rolling pin and lightly roll out one of your puff pastry sheets with just a little bit of flour. Don’t press too hard or your pastry may not puff up. Cut your dough to the desired shape. I just folded it with the edges, but if you want it to have a perfectly rounded shaped cut the excess off. 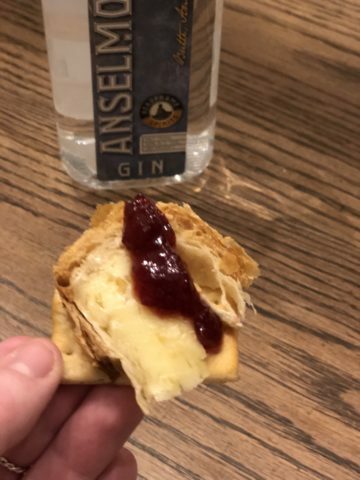 Put your brie in the middle and wrap the dough around the wheel. Ina bowl, whisk one egg with 3 Tb. of water, brush egg wash mixture onto your puff pastry wrapped cheese. Preheat over to 425. Place wrapped Brie into the oven for 10 minutes or until the puff pastry dough is clearly puffed up and lightly browned. Lower temp to 375 and let the entire pastry turn a nice golden brown color (5-10 minutes). Remove from oven and let cool. In a medium saucepan place 1 cup of your Cranberry sauce and 1/4 cup of your Anselmo Gin with a 1/2 tsp of cinnamon heat on Medium High. Let the mixture come to a light boil, stir, then lower the heat to low. Let the mixture remain on low while stirring for a few minutes then after a taste test pour the mixture on top of your puff pastry creation. Then, Feast! Happy Thanksgiving, Headframe Family! 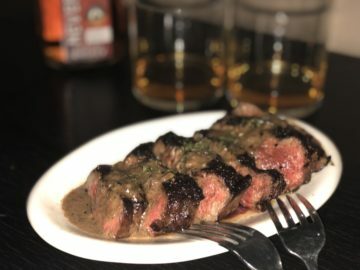 This recipe is for 21 and over. Hey Potter fans! 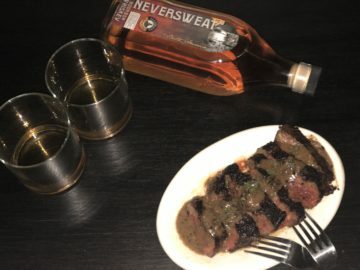 In honor of the release of the new Fantastic Beasts installment, Headframe Spirits decided to get extra spirited with the perfect cocktail to pregame with before the show. 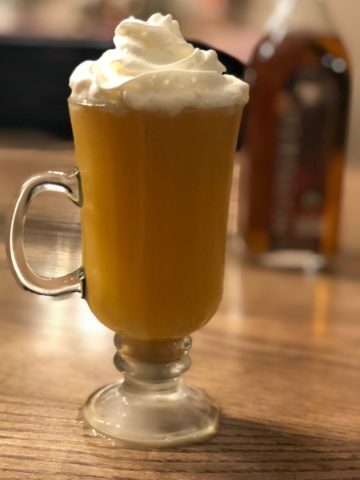 This adults only ButterBeer will give you all those Hogwarts feels with an extra nudge or two of our Neversweat Bourbon Whiskey. Wands at the ready, it’s Butterbeer time! In an iced mug, stir two tablespoons of warm water and the teaspoon of butterscotch pudding mix until well mixed but still liquid. If you added too much pudding mix the mixture will be thick, add water until it turns liquid. 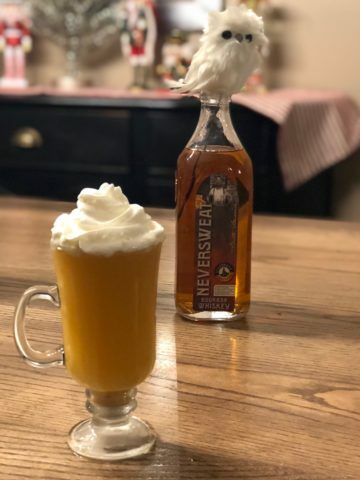 Add one shot of Neversweat Bourbon Whiskey, then fill the rest of your mug with cream soda and top it off with whipped cream. Boom, “accio-butterbeer” anyone? Move over Turducken, there’s a new Thanksgiving marvel in town: the PieCaken! We decided to make our own PieCaken filled with Headframe goodness, for 21 and over. 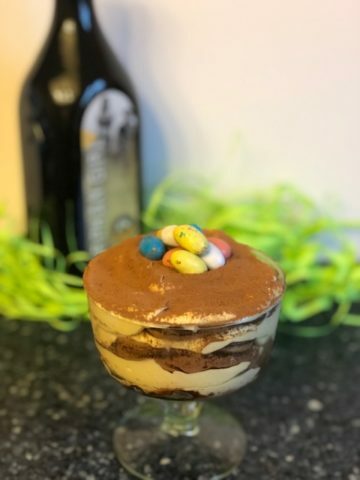 Warning: this dessert will make you the life of your Thanksgiving party and you will be asked to make it again and again for every holiday. Preheat the oven to 350. Make 2 boxes of Spice Cake, be sure to follow the instructions for high elevation if you live in the mountains like we do. Spray your springform pan with oil, pour cake batter onto the bottom until 1/3 is filled. Take your cooked and cooled pie and carefully place it on the batter. Fill the springform pan with remaining batter until it is 1 1/2 inches below the top of the pan. You will have remaining batter. Place your PieCaken in the oven with a tray on the rack below. Cook for 30 minutes then cover the top of the springform pan with tin foil. Begin checking the PieCaken every 15 minutes to see if the middle is still loose. It will begin to solidify. Total bake time is on average 1 hour. Every oven is different so be sure to continuously check. Using a toothpick check your cake by poking a hole into the middle, the toothpick should come out clean. Once done, remove cake and place on a wired rack to cool. After 15 minutes, use a buttered knife to slowly loosen the edges of your cake. Open the springform and allow the cake to fully cool on the springform bottom. Leave to cool. With a mixer, cream your 3 sticks of room temp butter, add salt and vanilla. Slowly add your sifted powdered sugar. Continue to beat until the buttercream is fluffy. Finish with 1 shot of Speculator and completely mix in. Set aside. In a saucepan combine 3 T. of Butter with Brown Sugar and Cinnamon on medium-high. Add your peeled and sliced apples. Continuously mix until caramel forms. Remove from heat and whisk in heavy cream. Set mixture aside to cool. 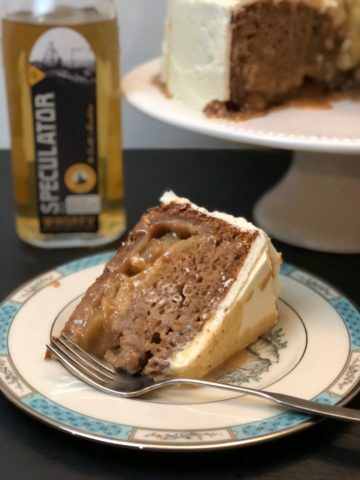 Once your PieCaken is completely cooled, spread on your boozy buttercream and top it with your caramel apples allowing some of the caramel to drip down the cake. We topped it off with a swirl of buttercream and a bay leaf for some Thanksgiving flare. 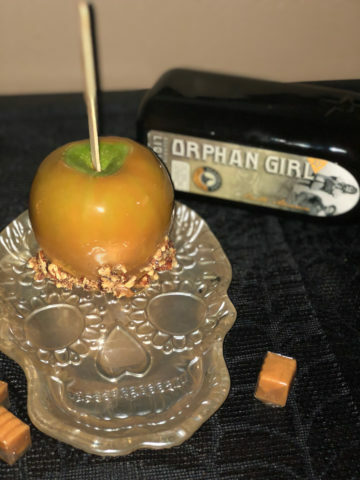 This is the type of treat that takes Halloween to the next level — sticky caramel with the pop of our Orphan Girl Bourbon Cream Liqueur and a fresh snap of Granny Smith Apple. Celebrating Halloween just got THAT much better. In a saucepan, stir all the unwrapped caramels and Orphan Girl Cream Liqueur on medium-low, be sure to store continuously to avoid burning. Wait until caramels have fully melted and mixed with the Orphan Girl. The consistency should be a thick liquid. Add an extra shot of Orphan Girl if the caramel is too tough. Take your dried apples and poke wooden popsicle sticks through the tops. Wipe off any apple juice. Take your apple by the stick and gently submerge it into the warm caramel making sure to get all the sides. Hold the apple out of the caramel for a few seconds (over the pot) then dunk again. 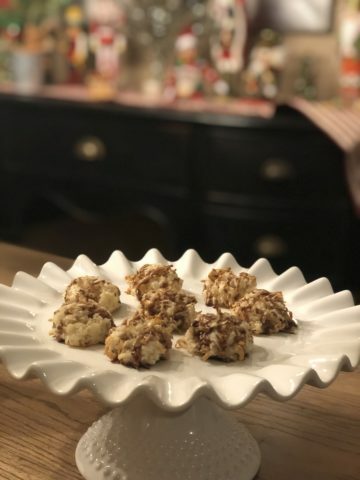 Place the apple immediately on parchment paper, unless you are adding a special topping, like nuts, which you apply by dipping your apple into while hot. Feel free to drizzle on some magic chocolate shell and make this into edible art, why not? Let your apples dry for at least an hour (the fridge works great for that), and voila, they are ready to enjoy! Hope your Halloween is extra spirited this year. In medium bowl: combine oats, coconut sugar, raisins, baking powder, cinnamon and salt. In small bowl: whisk eggs, coconut milk, Orphan Girl and vanilla until combined. Add egg and milk mixture to oat mixture. Add melted coconut oil and mix well. 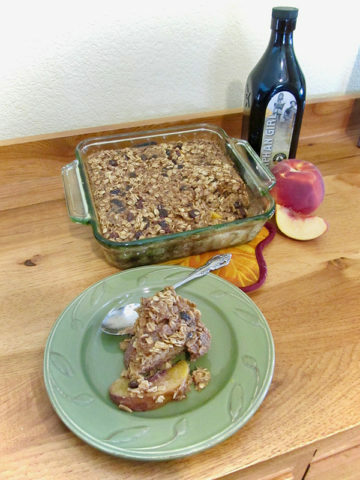 Place the sliced peaches into bottom of greased 8×8 baking pan. 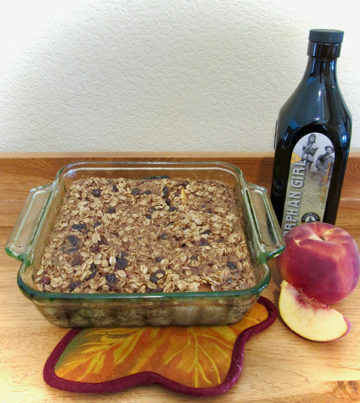 Pour oatmeal mixture over top of peaches and spread evenly. Pairs great with the Orphan Girl Boozy Crockpot Pumpkin Spice Latte! Enjoy! Fall is here! It’s time for pumpkins, cozy sweaters, and Pumpkin Spice Lattes. 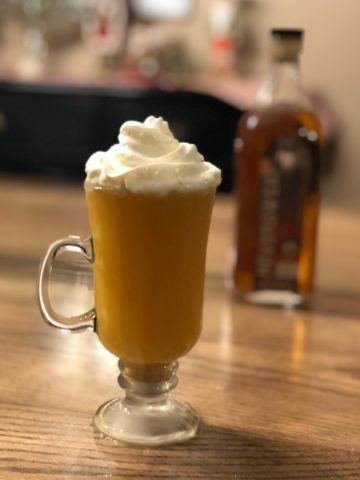 Ohhh ya, we’ve taken your favorite Fall drink and transformed it into a PSL with a big kick of Headframe Spirits. This is sure to keep you warm during those cold autumn nights. Best part, this recipe is super easy, just throw everything into the crockpot and voila — done! What could be better? 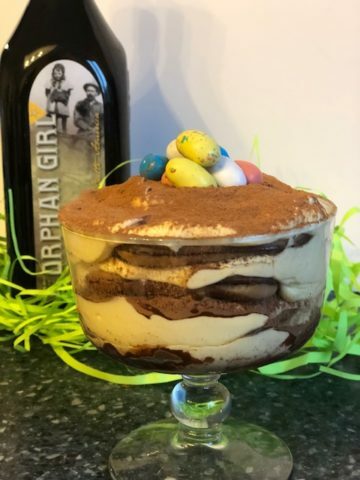 In your crockpot combine all the ingredients except for your Orphan Girl Bourbon Cream Liqueur and whipped cream. Set crockpot to low for 2-4 hours. 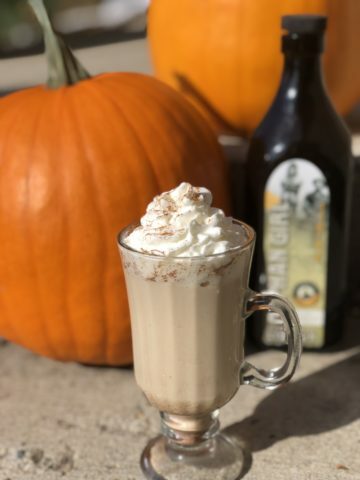 Be sure to stir your Boozy PSL and top off your drink with Orphan Girl (1-1.5 oz.). Serve with Whipped Cream and some Pumpkin Pie Spice Mix on top.